Editor: Many gringos and gringas think Cinco de Mayo is THE Mexican Day of Independence. But of course it is not. It’s September 16th – and it’s the 200th anniversary of the beginning of the war against imperial Spain. September 16th is that time of year when all Mexicans from around the world are celebrating Mexican Independence Day. On September 1810 Mexico began a 10-year war for independence with Spain and since the country gained its independence, things came a long way but violence is still too high. The American media has reported that president Felipe Calderon will be celebrating Mexican Independence Day with a $40 million extravaganza in Mexico City, the two-day party will include laser shows, fireworks, live music. It’s a way of giving hope to the Mexican people who are facing a terrible recession and are collateral victims in the war against narco-terrorists. Because two years ago these narco-terrorists threw grenades into the crowd gathered at a Mexican Independence Day fiesta, this year the security will be even tighter, since this is the Bicentennial. The first people to inhabit the land that now we call Mexico were indigenous people that created a few great civilizations such as the Olmec, the Teotihuacan, Maya, Toltec, and the Aztec Empire, one of the most powerful Empire in the world. In 1521, 500 Spanish soldiers, leaded by Hernán Cortés landed in Mexico and they decided to attack the Aztecs empire (the Aztecs ruled over all Mesoamerica). The indigenous people thought that helping the Spanish soldiers would be the best way to live their lives as they wanted so they started helping the Conquerors. So in 1521 the last Aztec emperor was captured and the people from the what was left of the empire fell in the hands of a more authoritarian empire: the Spanish. They ruled Mexico for three centuries, making the former Aztec empire a colony named Nueva España, which means the New Spain. It was a terrible period for the indigenous people. The conquerors brought many unknown and not treatable diseases, the New Spain was full of sick people or workers who were over worked. The colony was falling into pieces as many Indians perished. From almost 20 million Indians inhabiting the lands, after one century of Spanish rule, only 1 million of Indians were left. Things got a little hope after Napoleon invaded Spain and imposed his brother, José Bonaparte, as king of Spain (1808-1810). He only rules 2 years because the Mexican people started a war seeking their independence from Spain. They had the models from France and the United States and in 1810 they planned to start the war on October 2nd. The Spanish found out about their plans and the Mexicans had to move fast with their plan to revolt immediately. 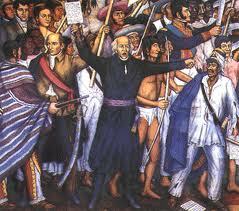 The riot started in the early hours of September 16, 1810 when father Miguel Hidalgo y Costilla, a Roman Catholic Priest, and his conspirators rang the bell of his church in Dolores, calling all the people from his village to fight for freedom. And this is how it started the 10-year-long war of Mexican Independence. Today the Mexican Independence Day is celebrated with fiestas at every street cornet, vendors selling flags, balloons and sombreros. Every Mexican puts out the Mexican flag outside the house and in the zocalo the lights are simply spectacular. That’s the place where the 16 de Septiembre is being celebrated and the place where the fiesta starts. The Mexican food served at the Mexican Independence Day fiesta is antojitos, Mexican candies and punch made of guayabas, sugarcane, raisins and apples. The traditional dishes are Mole Poblano, Chiles en Nogada, Guacamole and chips. The best of the fiesta is when the crown joins and shouts the names of the heroes of the Mexican Independence, ending the shouts with the traditional el grito: Viva Mexico!